What Food Group Has the Least Amount of Carbohydrates? What Can I Eat on a No Carb Diet? A no-carb diet is sometimes referred to as the Atkins diet, but you do not have to follow the Atkins food plan in order to consume low-carbohydrate foods. With a no-carb diet, it is important to stay away from starches such as potatoes, rice, pasta and bread. All of those foods are loaded with carbs and should be replaced with zero or low-carb foods instead. Some foods contain a lower concentration of carbohydrates per serving and are allowed in small portions. Cucumbers have zero carbohydrates, while lettuce, radishes and celery have one carbohydrate. Broccoli, brussels sprout, cabbage, carrots, cauliflower and asparagus are also low-carb vegetables that can be included in your diet. Raw egg white and egg yellow contain no carbohydrates and can be cooked in a variety of ways. A cooked egg, such as an omelet or hard-boiled egg, has one carbohydrate. It is okay to eat cooked eggs on a no-carb diet. A hard-boiled egg can be eaten with a fresh garden salad. An omelet can be paired up with sausage links for a high-protein, no carb breakfast. According to the U.S. Department of Agriculture, many cheese varieties such as Camembert, cheddar, Munster and parmesan have zero carbohydrates. Italian cheeses, including provolone and mozzarella, have one carbohydrate and can be eaten on a no carb diet. Most meats are high in protein and low on carbohydrates. The U.S. Department of Agriculture states that beef such as steak tips and hamburger meat can be eaten on a zero-carb diet. Poultry, veal, venison, bison meat, lamb and pork are all meat varieties that contain no carbohydrates, but can be high in calories, fats, sodium and cholesterol. Fish such as salmon, Alaskan halibut, sardines, anchovies, trout and mackerel are low in carbohydrates and can be eaten on a diet that restricts carb intake. Protein from meat can be eaten for breakfast, lunch and dinner, and can be prepared any way you'd like. Grilling meat is a great way to get flavor without extra seasonings or oil. 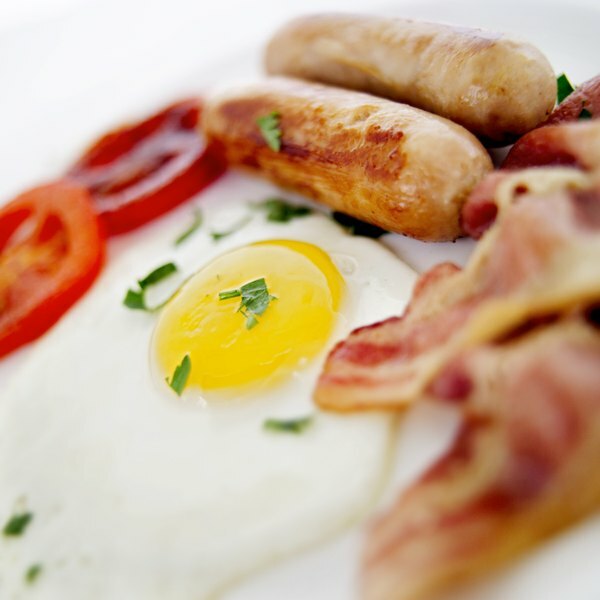 Breakfast foods such as ham and sausage links can be eaten as part of a no carb diet, but they do contain a lot of sodium. According to the U.S. Department of Agriculture, olive oil, peanut oil and safflower oil have 0 carbohydrates. These oils--but not canola oil--are allowed for food preparation. Add low-carb herbs such as dill, oregano, turmeric, sage and thyme to prepare diet food and add some flavor. Butter has no carbohydrates and can be used for cooking as well.